In February of 2014 someone approached us and told is they wanted to send us away before baby number three arrives. When I say us, I mean my husband and I – NO KIDS. They gave us a generous budget and let us choose the destination. After doing research and looking at various options we decided to travel over to the East Coast to check out the beauty of our own country – Canada. Here we are sitting in our car waiting for the ferry to arrive to go to Nova Scotia from P.E.I. This is day 5 of 9 of our CHILDLESS vacation. This trip has been like none other we’ve taken. Every fall my husband and I take a weekend getaway to celebrate our wedding anniversary. One of our parents takes our 2 daughters that weekend. Depending on finances we’re away one night or two. These getaways are important, not just for us as parents but more importantly they’re important for us as husband and wife. During those weekends away we get the opportunity to connect, talk and laugh… With NO INTERRUPTIONS. You remember those days? Before children. Well, one year I made a conscience effort not to talk about the kids. Afterwards, I remember thinking how good it was to FOCUS on us. No kids and no interruptions, driving through provinces, driving along the coast, riding the ferry and relaxing at local restaurants and ice cream shops we’ve been able to share struggles we’re going through, applaud each other’s victories and encourage each other to over come fears. It’s a challenge to have those kind of conversations with a young family. Having grown up with fears and insecurities both my husband and I missed out on doing fun things. For me one of those things was climbing the slide at the park. I didn’t do that until we had kids. Passing various opportunities we’d walk away saying to our selves ‘I wish I had done that.’ We agreed early on that on this trip we would not let that happen. 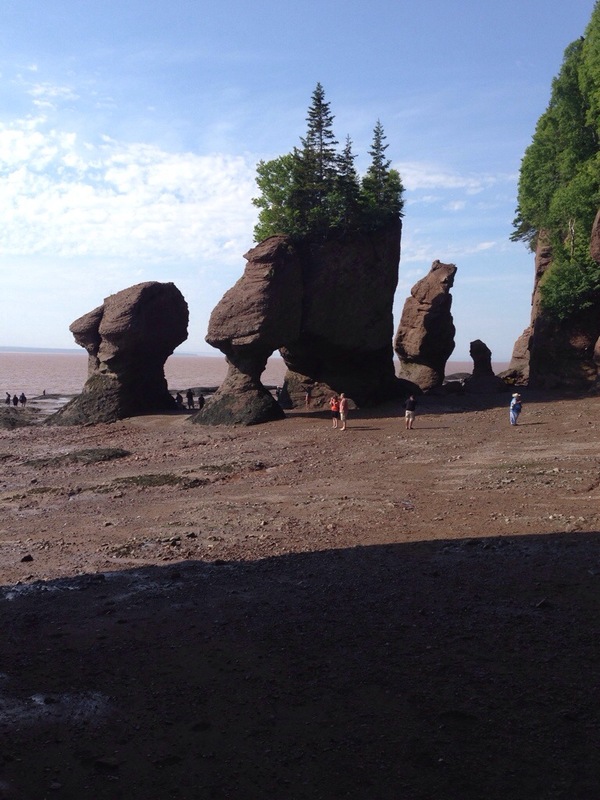 Our first stop was in New Brunswick. 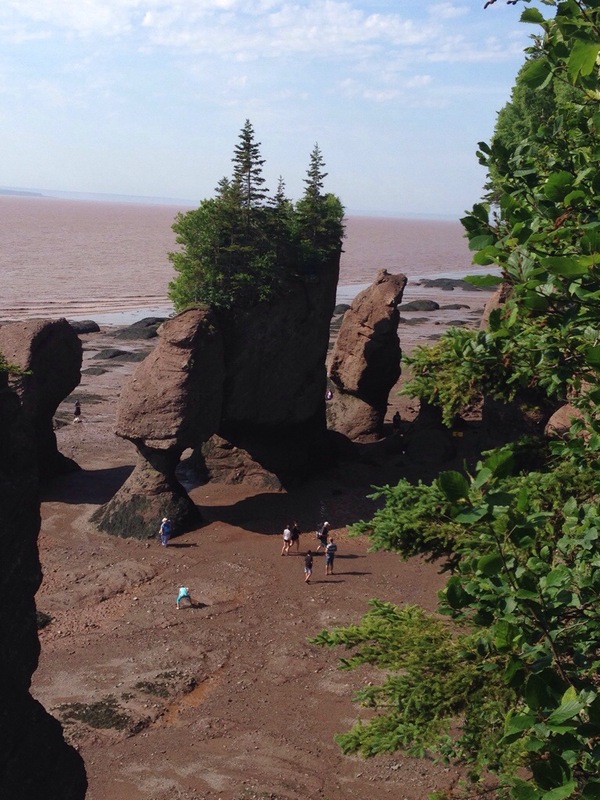 On our first full day there we went to see the Hopewell Rocks at the Bay of Fundy. It’s amazing!!! Well, after being there a while we noticed people walking ‘the ocean floor’ sounds luxious doesn’t it. Well, it’s about 100 feet of mud from shore to the water. We looked at each other and smiled. We had a very short discussion of wether or not to do it. Off came the sandals, I rolled up my capris – the mud went at least knee deep. I’m 7 months pregnant so we knew we had to walk slow. At about 70 feet out I lost my balance and fell!!! My backside covered in mud! After a moments shock I laughed, then he did. I’m sure that if that had happened a year ago, even 6 months ago my reaction might be different. What would also be different, is if our kids were there. 1) we wouldn’t have walked as far as we did 2) we wouldn’t be able to share that victory TOGETHER. With the busyness of life it’s easy to forget to talk to each other. I mean really talk. Not just ‘how was your day?’ Or ‘what’s the plan for tonight?’ I mean really talk – like we did before children. It’s easy to justify – I don’t have time for that. Make time. It will change your marriage and your life. It took us months to plan this trip. Plan and save for your own getaway.